This Sturmgeschütz 40 III Ausführung G Tank Destroyer with the long barrel 75 mm Stu.K. 40 L/48 main gun can be found at the Tank Museum, Bovington, England. 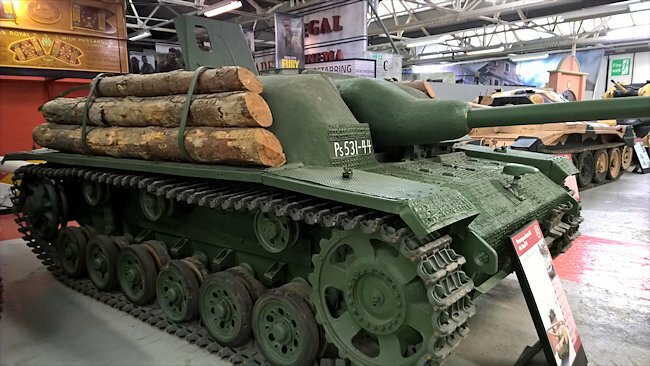 It was used by the Finnish Army to fight the Russians in Finland. 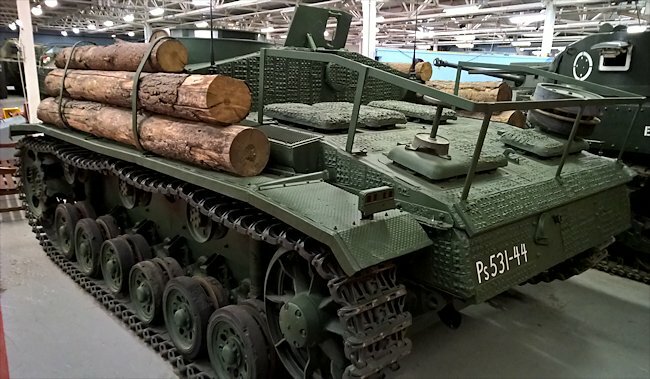 It is unusual compared to other StuG IIIs in that the Finnish Army added concrete to the upper hull for additional protection. The crew gave it the nickname 'Maija'. This Finnish Army StuG III Ausf. G Sturmgeschutz Tank Destroyer is on show at the Tank Museum, Linsay Road, Bovington, Dorset. The nearest train station is Wool Railway Station. You can walk the 2 miles to the Museum but there are not pavements along the country road and if you are travelling with children it can be dangerous. It takes 45 minutes by foot. There is an irregular bus service from Wool Station that will get you to the museum but they only come once an hour in the morning starting after 9.30. This StuG III was armed with a 75 mm StuK 40 L/48 gun that could fire AP armour piercing rounds and HE high explosive shells. It was also armed with a 7.92 mm MG34 Machine gun fixed to the roof. It had a four man crew: commander, gunner, loader and driver. They were protected by armour that ranged in thickness from 16 mm - 80mm but the Finnish Army added an additional protective layer of concrete to the upper hull. It was powered by a Maybach HL 120 TRM V-12 petrol engine that produced 296 hp. It had a top road speed of 40 km/h (25 mph) and an operational range of 155 km (96 miles) before the crew needed to refuel. It weighed 23.9 tonnes before the concrete layer was added. In 1943 a thirty of these weapons were supplied by Germany to the Finnish Army to aid their struggle against the Russians. A further 29 were sent in 1944. 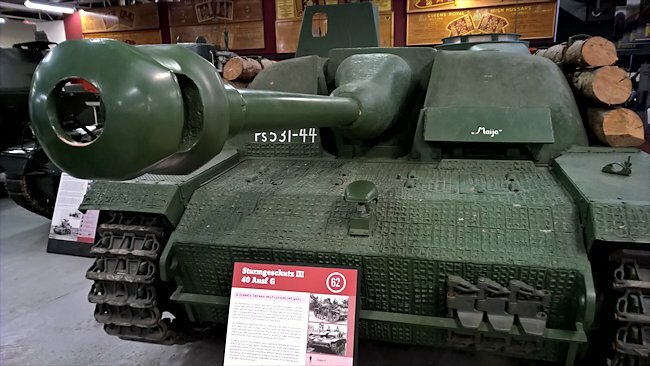 The Bovington Tank Museums Stug III was supplied from Finland and includes certain features that are peculiar to the Finnish Army Sturmgeschutz. 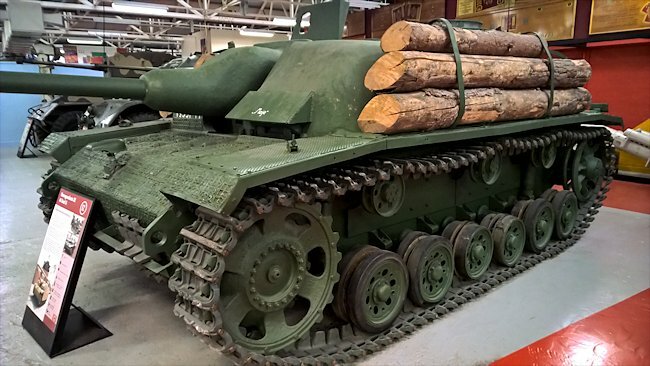 For example extra armour, different lighting arrangements and, most obvious of all the arrangement of logs on the side to increase protection. One of the most notable alterations is the armored cover over the driver's visor considered by many a weak spot! The Sturmgeschutz, or assault gun, was a very popular weapon in German service. 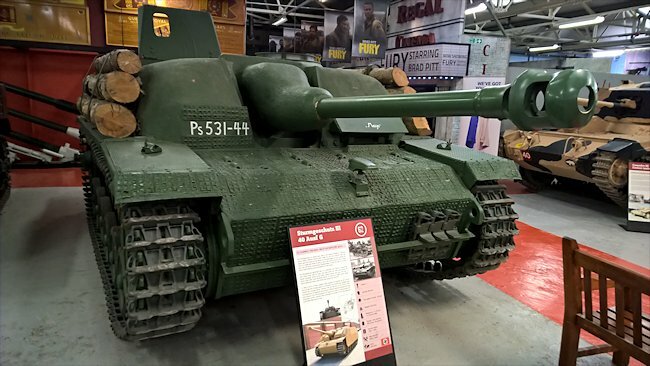 Many different versions were made but the most common type was based upon the chassis of the Panzer Ill. The advantages of such a design are that it is simple and cheap to build, it has a low profile and can carry a larger gun than the turret could accept. Disadvantages include the lack of a turret, which limits flexibility, and vulnerability to flank attack. The Sturmgeschutz performed best in a defensive role, often in conjunction with heavy tanks s h as Tigers, and they came into their own during the Italian campaign which suited these ambush tactics very well. The gun, a 75mm StuK L/48, could penetrate 85mm of armour at 1,000 metres range, which effectively meant every Allied tank except the Churchill. The Ausf G version of the StuG III was the final and by far the most common of the StuG series. Upper superstructure was widened: welded boxes on either sides were abandoned. This new superstructure design increased its height to 2160 mm. The back wall of the fighting compartment got straightened, and the ventilation fan on top of the superstructure was relocated to the back of the fighting compartment. From March 1943, the driver's periscope was abandoned. In February 1943, Alkett was joined by MIAG as a second manufacturer. From May 1943, side hull spaced armour plates (Schurzen) were fitted to G models for added armour protection, particularly against Russian anti-tank rifles, but were also useful against hollow-charge ammunition. Side plates were retro-fitted to some Ausf. F/8 models, as they were be fitted to all front line StuGs and other tanks by June 1943 in preparation for the battle of Kursk. Mountings for the Schurzen proved inadequately strong, as many were lost in the field. From March 1944, an improved mounting was introduced; as a result, side skirts are seen more often with late model Ausf G. From May 1943, 80 mm thick plates were used for frontal armour instead of two plates of 50 mm + 30 mm. From November 1943, G versions were fitted with the 'Topfblende' pot mantlet (often called Saukopf "Pig's head") gun mantlet without a coaxial mount. This cast mantlet, which had an organic shape, was more effective at deflecting shots than the original boxy mantlet that had armour varying in thickness from 45 mm to 50 mm. The lack of large castings meant that the trapezoid-shape mantlet was also produced until the very end. A coaxial machine gun was first added to boxy mantlets, from June 1944, and then to cast Topfblende, from October 1944, in the middle of 'Topfblende' mantlet production. With the addition of this coaxial machine gun, all StuGs carried two MG 34 machine guns from fall of 1944. Some previously completed StuGs with a boxy mantlet had a coaxial machine gun hole drilled to retrofit a coaxial machine gun; however, 'Topfblende' produced from Nov. 1943 - Oct. 1944 without a machine gun opening could not be tampered with. Also from Nov.1943, all-metal return rollers of a few different types were used due to lack of rubber supply. Zimmerit anti-magnetic coating to protect vehicles from magnetic mines was used only from September 1943-September 1944.